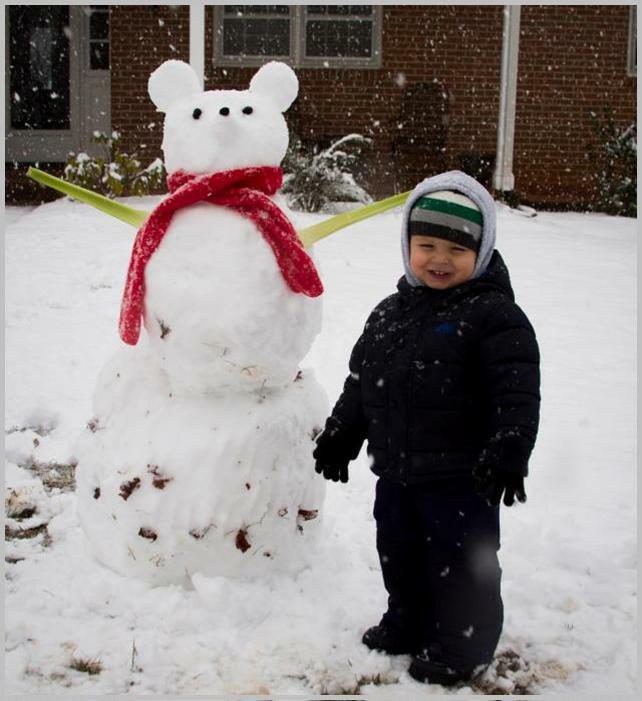 Yesterday morning my family was delighted to wake up to about 4 inches of snow on the ground. We quickly bundled up and trekked outside to enjoy (hopefully) our last snowfall of the season. I love contrasting playtime in cold, wintery weather with a warm, comforting meal. So after we played awhile in the snow, we trudged back into the house to warm up. I’ll admit, the snow provided me with the perfect excuse to catch up on blogging while experimenting with my favorite comfort food: the potato. 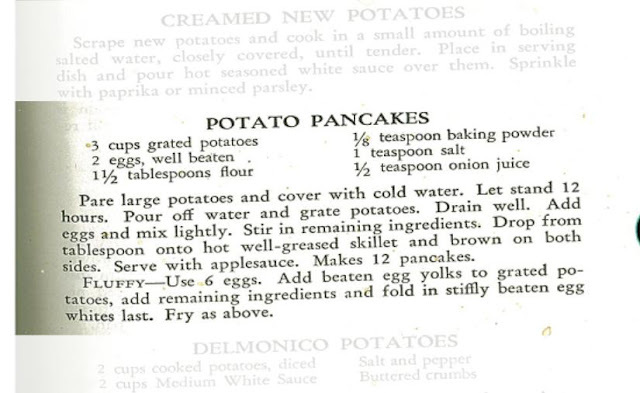 I returned again to the Victory Cookbook and found a recipe for potato pancakes that sounded promising. Be advised: If you lack patience, this is not the recipe for you since the peeled potatoes must sit, submerged in cold water, for 12 hours. But I wasn’t about to let time prevent me from testing this recipe, so I got up early (pre-snow adventure) to pare and soak the potatoes so we could enjoy potato pancakes by dinner time. This recipe is clearly ration-point friendly as all of the ingredients used would have been abundantly available during wartime and none of the ingredients required ration points. Hooray! After letting the potatoes soak, I grated them with a standard box grater. 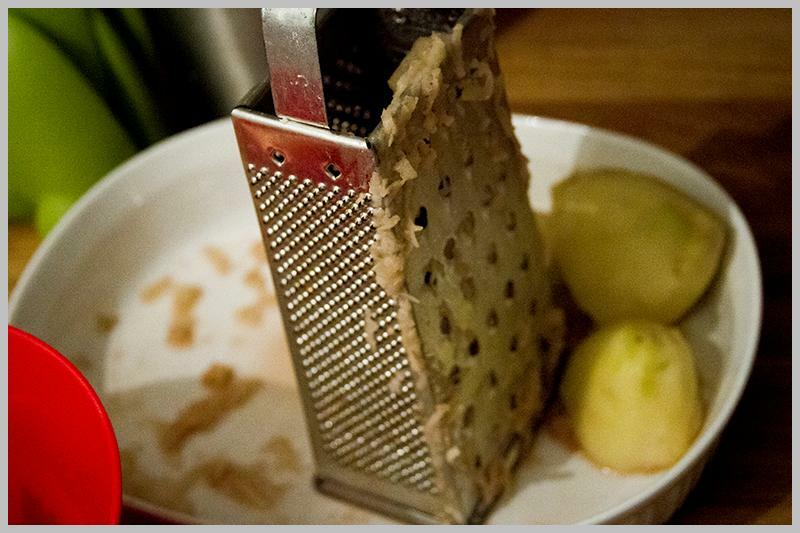 Because I am terrified of any encounters between my fingers and the grater, I made sure to leave a substantial potato barrier – as you can see from the photo. Grating the potatoes took nearly an eternity. And after said potatoes were grated, I squeezed out as much liquid as possible from the potato shavings. That part was a little gross but painless. Then, very gingerly I mixed the eggs into the potatoes. Finally flour, baking powder, salt, and pepper were added and mixed thoroughly with the potatoes. For the final step, I lightly sprayed a non-stick skillet with a non-stick spray and dropped the potato mixture by spoon into the pan. Once the pancakes had browned on one side, I flipped them so they could brown on the other. You’ll know the pancakes are browned on a side when they no longer stick to the pan. The finished product was hashbrown-y and delicious. My two-year-old especially couldn’t get enough of the stuff. The cookbook recommended that the pancakes be served with a side of applesauce, but personally, I think I’d prefer it served with sour cream or ketchup. For those of you that are interested in testing the recipe for yourselves, here it is!